Normally, the default iOS keyboard presents you with the alphabet. When you want to access the numbers, you just tap the “123” key, and then the numbers and symbols will appear. In order to revert to the letters, you have to then press the “ABC” key. There’s a faster way to type numbers, though. Anyone familiar with Android devices knows you can press and hold keyboard letters to access numbers and symbols. iPhone users don’t have that kind of convenience, but this little trick is almost as good. If you press and hold the number button instead of letting go, you can swipe your finger up the number or symbol you want. When you let go, the letters will reappear, no need to tap the “ABC” key to revert back. Similarly, if you tap the “123” key, you will notice that the Shift key transforms into the “#+=” key. Just like with the “123” key trick, this will let you tap and drag to enter a quick symbol and then revert to the numbers. 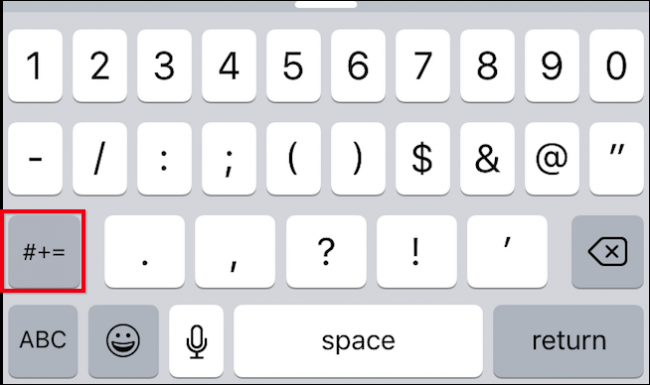 Keep in mind that in order to access the extended symbols screen, you will first need to tap open the “123” key first, so if you want to use brackets or the pound sign, the numbers screen has to be open first. The majority of these symbols typically work with numbers, so the hold and swipe will often be appropriate in such cases. Most of the time however, you’re more likely to use the hold and swipe method with numbers, but it’s still good to know you can do the same with the symbols.